Making a bank transfer is one of the most convenient and secure deposits methods to opt for when funding an online casino account. Also known as a digital wire transfer, this method is considered to be the safest option to deposit and withdraw larger amounts of money and as such we’ve compiled a guide on just how to make a bank transfer using Internet banking. We’ve also included the safest sites which accept wire transfers so you can get started on the process. Using your bank account to fund your online casino account has the benefit that you don’t need to sign up for any additional web wallet accounts or enter any financial data such as card details. The only draw back is it may be a little slow, as bank transfers are the only casino deposit method that isn’t processed on the spot. Bank transfers can be somewhat time consuming but top online casinos accepting the payment method do everything they can to make it a swift process. 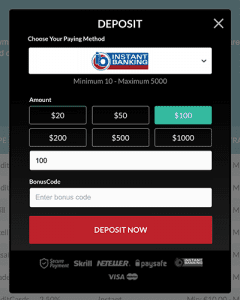 An example of an online bank transfer page at Guts Casino. Once you are logged in and on the cashier page, click the ‘Bank Transfer’ option – it may be called ‘Direct Bank Transfer’ or ‘Instant Banking’ – and you’ll either be connected via secure web servers to a page of available banks (this is list is dependant on your country) or to a page showing the casino’s bank account details. For the first option you can pick your bank and you will be directed to your Internet banking where you are required to enter your details (secure if you opt for the sites listed below) and the online casino’s bank account details will be filled out for you. Confirm the transaction and it will be processed. For the second case, or if your bank isn’t available, you will need to copy the online casino’s bank account details and enter them via your Internet banking or at your local branch if you don’t have online banking. Unfortunately, for a standard digital bank transfer, the transaction won’t be processed instantly. Instead, it will take from three to five days to process until you can get playing with real money. What’s more, if you fill the wrong details out this will slow the process down even further. However, there are options to speed the process up – some online casinos will offer Instant bank transfers where you pay an extra fee (some sites may not charge) in order for the deposit to appear in your online casino account immediately. Which casino websites support bank transfers? There are hundreds of online casinos which support digital wire transfers, but only a selection around the world which are secure. If you want to make a real money deposit using bank transfer, head to any of the top-rated online casinos recommended on our page and check to see if bank deposits are available. These online casinos accept a variety of currencies and players from all over the world. Your financial institution will most likely be listed when opting for these sites and making a digital bank transfer. Safe online payments are incredibly important when it comes to playing at casinos with real money, irrespective if you are located in the US, UK, AUS, NZ, EUR or elsewhere in the world. Ensure a casino is protected by SSL before making a deposit. The online casinos listed above are used by our team as they have been verified as safe thanks to the digital encryption (such as digital SSL 128-bit and TLS 1.2) employed to protect transactions, including when opting to fund your account with digital wire transfers. If you are opting for the instant play casinos we’ve listed above you will notice a padlock present in the toolbar of your browser (Chrome, Firefox, Safari) which confirms the encryption technology. Opting for any downloadable version of the sites listed above, you are still depositing in a secure environment as they have been confirmed by real players to only offer safe cashiers. When it comes to Internet banking, if you don’t feel secure entering these details or even opting in for the service you can always make the transfers over the phone or head into your local branch with the casino’s bank account details to fill out the form with. This may slow the process up further, but it is an option for those sceptical about entering payment details online. For those who do opt for Internet banking, we recommend avoiding writing down your login details – remembering them is the best way to keep them secure. If you prefer to manually fill out the casino’s bank account details, your Internet banking will offer the same encryption technology our reputable sites use and you will therefore be performing a secure transaction. If you’ve been connected to your Internet banking via the online casino’s servers, you will still be safe when opting for the casinos listed above. Once the deposit has cleared, whether you opt to speed it up by paying an extra fee or not, you will be able to get playing real money casino games, such as the slots, blackjack, roulette, baccarat, craps, and more. If the idea of making a transfer with your bank account is making you nervous, or you don’t want to wait for those processing times, there are plenty of other safe payment options for online players. A majority of the alternative deposit options are processed immediately, so you’ll be able to start playing games for real money straight away. To see what deposit options are available at your chosen online casino, use the FAQ section or sign in and go to the deposit page for more details. Always make sure the site is protected by a minimum of 128 Bit SSL (secure socket layer) digital encryption – stick with the venues recommended on our page to make sure.